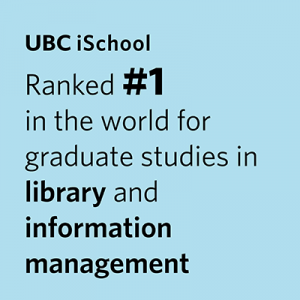 The PhD program at UBC iSchool (Library, Archival and Information Studies) is currently accepting applications for admission to our Fall 2019 cohort. Our Ph.D. program is a four-year funded program that combines coursework with focused independent study and research. Students have ready access to faculty members and advisors and benefit from unique opportunities at a research-intensive university. Areas of focus include human information interaction and design, knowledge organization, digital archives/ media, language processing, social media, cultural heritage and records and information management. Our award-winning faculty are recognized provincially, nationally and internationally, with research projects in funded in excess of $1M each year. Curious to learn more? We’re hosting an online information session for prospective PhD students on Tuesday, November 27 from 3 to 4 p.m. RSVP now. You’ll meet the PhD Program Chair, our Educational Services Coordinator and a faculty member from the admissions committee. Applications for the program are due January 15, 2019. If you have an questions about the program, please check out our website or send inquiries to the Educational Services Coordinator at ischool.edsc@ubc.ca.